Hawthorne Books, c1970, Number run (345678910), 301 pages. VERY GOOD Condition Hardcover with a VERY GOOD Condition Dust Jacket protected with a Mylar Cover. This book is ex-library with usual markings, light dj edgewear, light cover edgewear(see Scan). Pages & Binding are NICE & TIGHT! This listing is ONLY for "The Story of the Second World War The Allies Conquer". One of the scarcer Red Reeder titles. The Second in the two volume history of WW II by Colonel Reeder. 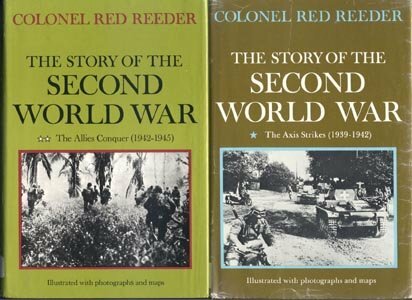 Volume II of Colonel Reeder's history of World War II takes up the story in June of 1942, when Eisenhower arrives in London, and continues through the end of the war . The details of this war-each important battle, the military tactics, the fighting men, the government personages-are set forth clearly and objectively. Colonel Reeder's personal involvement in the war, in addition to a firsthand supply of anecdotes gained from friends in combat branches of the service, adds valuable human-interest touches to this carefully researched history. "War is more than statistical evidence," writes the West Point Library reviewer of Colonel Reeder's first volume. " An old soldier-one of the very best-such as our author knows this fact. His style is crisp and engaging. Stories, anecdotes, entries from diaries, enliven the principals and perhaps lay bare their motivations. Its readability is this history's prime asset, which makes it a valuable tool for the young student; but it should also prove of importance to the older generation." Useful appendices include a chronological table of events of the war, a synopsis of major conferences, and a fine bibliography and index. Buyer pays $3.85 Shipping in Continental U.S. **Payment must be received within 10 days of the end of the auction, unless other arrangements are made. Checks held till clear. Money Orders & Paypal Payments shipped on receipt. Buyer Must Request Insurance at Additional Expense for $1.40 for up to $50. IL residents Must add 7.25% sales tax. If you are looking for another book, just EMAIL meThanks! Happy Bidding! Good Luck!